This endearing movie has aged remarkably well. It is about a bullied boy, Bastian (Barrett Oliver), who owns quite a few books but who, on a chance encounter with a mysterious bookshop owner when being chased, comes across a very special book. As he reads, the imminent end of the land of Fantasia is unfolding before him. To halt the crisis, the young warrior Atreyu (Noah Hathaway) must quest through various trials and terrains to help the Empress. There are stunning panoramic shots with rich colours which show up nicely on the Blu-Ray's 1:2.4 aspect ratio. Though some of the effects may seem clumsy to our pre-CGI eyes, to children I suspect the suspense and plot would greatly over-ride such concerns. The opening number became a stand-alone hit and I guess the disc is a nostalgia trip for many adult viewers. The power of reading and imagination is the dominant message and I personally cannot think of a more appealing and worthy one. The main child actors are both very capable and the overall naivety is adorable. I can't look back on the film as most people do because I never saw it as a child. 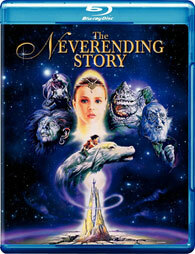 I kind of hate that it is with jaded eyes alone I have to review The Never Ending Story. The DTS HD Master Audio is lush and all-embracing. The disc has no special features but does offer several languages. Director Wolfgang Petersen has made films varied in theme an quality, from the famous epic Das Boot to Air Force One and Troy. His “touch” is very visible. Parents of very young children may not want them to go through some of the more “scary” scene. There is also a pair of statutes with very clear breasts: I wonder if a movie in 2010 would try something similar? So despite the G-rating, I would urge some caution. I quite like this movie and would recommend it for those wishing to go down memory lane, with or without their children.